There are over a billion active users of Google’s version of Android. Add AOSP and we are probably in the 1.6 to 1.7 billion range of users on Android. Both will grow — however, I believe Google’s version of Android will grow at a more rapid pace than AOSP. This is largely thanks to big and fast growing markets where smartphone penetration is still relatively low — India, Brazil, Indonesia, and other surrounding regions in Latin America and SE Asia. While AOSP works in China, most vendors I speak to plan on using Google’s services outside of China. This is what Google recognizes and why they are releasing their Android One Program. This concept is nothing new. Every main SoC provider — Qualcomm, MediaTek, and others — already offer reference design platforms designed to provide turnkey solutions for low-end players to go to market extremely fast. Months in some cases. The next billion new smartphone users will enter the market with a product that costs less than $200 and a large percentage of this next billion will buy devices costing below $100-$150. Based on what Google just shared with us on developer payouts this is an extremely significant point. Google announced they have paid out five billion dollars to developers over the past 12 months. Not bad since the year before they paid out two billion dollars to developers. However, Apple has likely paid out near $10 billion to developers in the same time frame (Benedict Evans estimates). The key distinction here, which Benedict Evans points out in this post, is Apple has paid out approximately double the amount of Google to developers with less than half the active install base. Android has over 1b and iOS with just less than 500m (trailing 24mo..likely around 350m of those are iPhones—my estimates). This last point of revenue payout to developers relative to ecosystem size brings up the significant point I am talking about. Developers make more money with iOS than Android (even though the installed base is larger). A large percentage of the current Android installed base is not on the absolute cheapest device in the world. To put it succinctly, Google–Android–likely has the most profitable customers they are going to get. So what does this mean for developer revenue opportunities when the next billion new Android users will come from devices on the extreme low end? It is extremely important Google is active in getting new customers online, empowered with a pocket computer, in every region of the world. The problem however, is this group is likely not profitable to anyone but Google and even that may be debatable. Connecting the next billion is massively important but is it profitable? Who will be the hardware OEM, chipset providers, screen manufacturer, willing to chase pennies to serve this market? Certainly Samsung will not. Will it require a new business model like Xiaomi’s where the service is where the money is and not in the hardware? This is an important and overlooked question in my mind with no clear answer yet. What is exciting, and also scary for many, is when money is no longer in hardware (which is about to the case in the growth markets for smartphones) it opens the door to business model innovation. That is why I’m certain this chart will look dramatically different in three years. 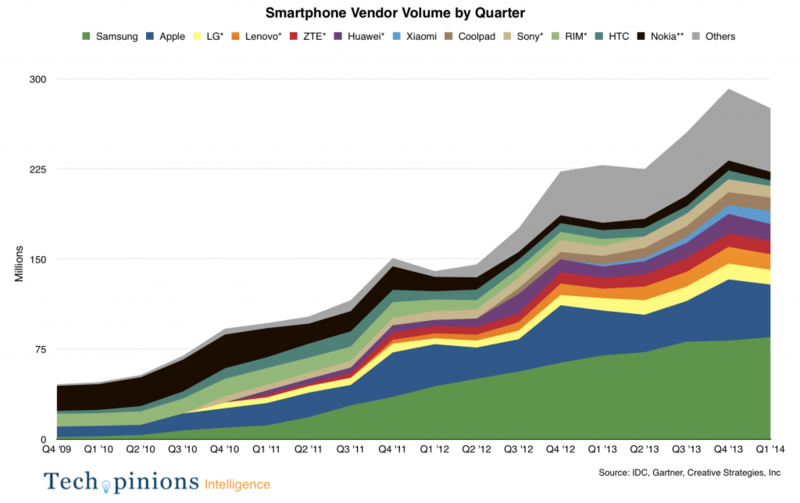 This chart originated from a Tech.pinions Insiders article on my updated Smartphone Installed Base and Vendor shipments.